The University of Missouri-St. Louis Libraries are committed to providing individuals with disabilities reasonable access to materials, information, and services. The Libraries provide a variety of immediate and extended services for patrons with disabilities. In person: Bring a list of items (these cannot be for personal use - they must be for a current class project) to be pulled or photocopied to the Circulation Desk. Call numbers must be provided for all items. If you need help determining call numbers, contact the Reference Department by e-mail with the Research Consultation Form, telephone 314-516-5060, or in person at the service desk. Requests will be filled within one business day. Circulation personnel will retrieve materials and assist with photocopying as staffing allows. We can retrieve or copy up to 4 items at the time of the request; all others will be completed within one business day. All telephone requests and lengthy lists will be completed during weekday operating hours. The only costs incurred are the standard self-service photocopying rates of ten cents per sheet. Please bring sufficient money to make the amount of copies requested. Insufficient funds will result in an incomplete request. Materials will be held and must be picked up at the circulation desk. Assistance filling out Interlibrary Loan request forms is available upon request at the Interlibrary Loan Office - Thomas Jefferson Library, Room 331. MOBIUS/MERLIN - Assistance in completing requests to borrow materials not found in our collection from other libraries is available upon request at the reference desk. The Libraries will accommodate use of proxies to check out material for a person with disabilities as long as the person is registered with the University of Missouri-St. Louis Disability Access Services Office. At the time of the request, the Head of Access Services Department will contact the University of Missouri-St. Louis Disability Access Services Office for verification. The Libraries will extend loan periods for a person with disabilities as long as the person is registered with the University of Missouri-St. Louis Disability Access Services Office and provides the Libraries with a one-business day notice so that verification can be acquired. At the time of the request, the Head of Access Services Department will contact the University of Missouri-St. Louis Disability Access Services Office for verification. For reserve items, the Head of Access Services will contact the faculty for their approval to extend the loan period and ask for their guidance on the length of the extension. Reference librarians are available to answer your questions and assist in finding information sources, as well as provide custom tours of the library and assistance in identifying and obtaining special formats. Please see the Ask-A-Librarian page for more information. 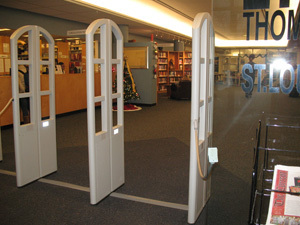 The Thomas Jefferson Library, the Mercantile Library, the Western Historical Manuscripts Collections and University Archives are easily accessible by wheelchair through the front doors which are equipped with automatic door opening devices. 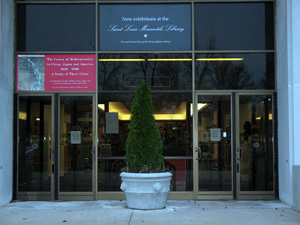 Wheelchair accessible restrooms are located on the third level (entrance level) of the Thomas Jefferson Library. Elevators are also accessible from the entrance level. An extra wheelchair is available for use in the Thomas Jefferson and St. Louis Mercantile Libraries. Most of the library collections, including the general collection, reference, and government documents, are housed in open stacks. Portions of these collections are in compact shelving. Persons with mobility disabilities may request assistance from Circulation and Reference desk staff to reach materials and/or to move compact shelving. Patrons may use the Table -Top Video Magnifier (CCTV) that enlarges print material. 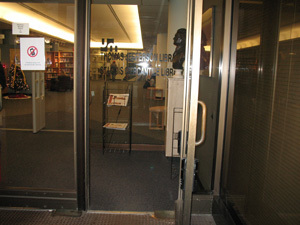 This equipment is located near the entrance to the Library Instruction Room (Room 315) in the Thomas Jefferson Library. A wheelchair accessible public access workstation is available for priority use at the Thomas Jefferson Library. The Library Research Commons in the Thomas Jefferson Library offers an authorized user one workstation with adaptive software that includes: ToggleMOUSE, Dragon Naturally Speaking, JAWS, Read&Write, TextAloud and ZoomText. Disabled community patrons will have the same service that we provide to non-disabled community patrons. The study rooms located in the Thomas Jefferson Library may or may not be accessible to wheelchairs. The patron will have to check for themselves or have a friend or assistant check for them.